Why the title? 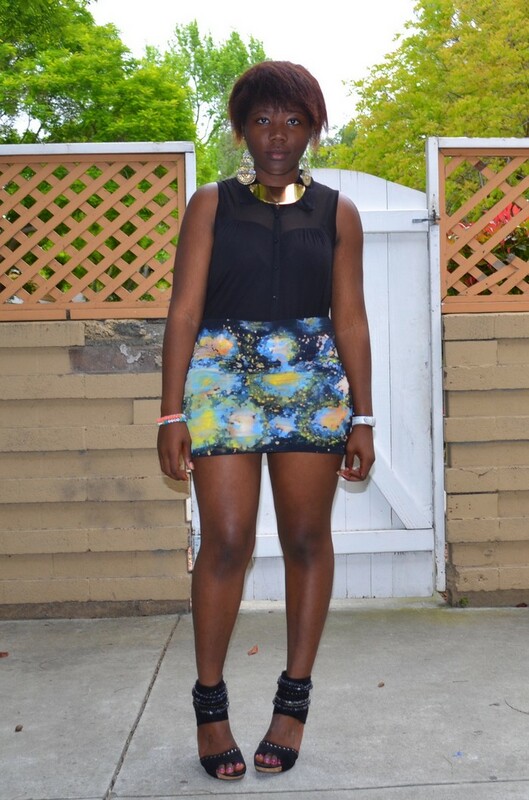 Well I wanted to try the galaxy prints, so I DIYed this skirt. I was expecting a different result, hence the "failed". But well, even if it doesn't look like a galaxy, it doesn't look that bad, so I'll definitely be wearing it. Pourquoi le titre? En fait je voulais essayer le motif galaxie, donc j'ai la jupe moi meme. Je m'attendais a un resultat different, d'ou le "failed". Mais bon, meme si ca ne ressemble pas a une galaxie, c'est pas si mal que ca donc je pense que je la porterais surement. Now to the biggest point! The first giveaway I did was around my birthday, when I had around 50 followers. At that time I was so amazed that so many people got interested in my blog. Now, many months later, this number got 4 times bigger and I can't even express how grateful I am to have such amazing people following me! I really enjoy blogging, and reading all those sweet comments motivates me even more! As a thank you for all the support, I am giving away one asymmetric skirt! It is a galaxy skirt just like in the picture below! You can enter the giveaway by following the instructions on the Rafflecopter! The giveaway is open internationally!! Until May, 31th!! Good luck! I think the skirt did turn out fine as you pointed out. I like it as I mentioned earlier. I'm so happy for you regarding your followers. Keep it up love! Awh, the skirt turned out great! Me encanta lo bien que combinas todo,esta muy guapa. wouah....j'adore, j'adore ta tenue, ta jupe et tes chaussures sont magnifiques. Beautiful galaxy skirt. Love your shoes. So fierce. I love your DIY skirt. It looks like a galaxy to me! (: And I don't see anything wrong with your hair. Both skirts are stunning! Even if it's fail, I love it just the way it's now! GIRL you amaze me everytime with your DIY the skirt is amazing I just cant wait to see how you do it I love it and what a great giveaway I already own mine and love it the fabric is so unique dear. Great graphic skirt! I am now following via GFC. I think your skirt looks great! love that galaxy dipped hem skirt! i randomly found your blog because i am about to buy the Romwe studded loafers! bon boulot! suis contente pour le giveaway, j'y participe et j'espere gagner cette magnifique jupe mullet hem!! I´m in love of your skirt, is amazing!!! Yea, I would have to agree with you that it didn't turn out too bad =) You are definitely up-to-date with fashion as galaxy items are very popular lately. Whatever it was meant to be, the skirt looks amazing with those splashes of colors! Love your necklace too Diane! Thanks for hosting a wonderful givewaway! yey! i so like that galaxy skirt... i still haven't one! Such a nice print it turned out to be, still very interesting. Love the necklace also. You look fab. Elle est canon cette jupe! Jolie look, j'aime bcp ta jupe! Whooop the skirt looks amazing and even looks good on you!